I was watching one of my favorite TV shows recently: “Shark Tank”. On the show, people with new products and business ideas come to the experts looking for an investment and assistance in expanding their business and idea. The one that impressed me the most was two women who had developed a trap for bedbugs using a special bait they’d developed. It sounded like a great thing, especially for hotels and public housing. It’s just a little trap, smaller than a mousetrap, that slips underneath the mattress. No one knows it’s there, yet it does its work. It could be easily checked, without alarming anyone. There seemed to be full protection in this ideal product. The ladies had not only patented the idea, but had gotten protection worldwide for their special bait formula. It was such an attractive idea and product that all four of the “sharks”, investors, wanted to invest in it. They were almost fighting over who would bid the highest. What’s that got to do with SFG? Well it reminded me of some of the frequently asked questions that I’m gathering together in a new book that should be out before Christmas 2012. Many of the questions people ask are about ants and how to get rid of them. Of course I had to investigate into why they’re there and what’s attracting them before we could decide the best way to get rid of them. You’ll be able to read all of the answers once this book is published, but what attracted me to more information was a newspaper add for a pest control company that specializes in ant elimination. Here’s what they said in their ad: “First of all, ants are liquid feeders. The food they eat is an almost exclusively secretions from aphids and white flies.” Then they listed the backyard plants that attract aphids and white flies. It included hibiscus, junipers, pines, and conifers, rose bushes, and all citrus trees. None of those are in a SFG, yet we get a lot of letters saying “Ants have invaded my SFG!” I ask “Why?” and they ask “How?” to get rid of them. The purpose of this blog is to ask you, the reader, “What do you know about ants? Why are they in your garden? How did you get rid of them? Is it true that they feed primarily on the secretion of aphids and white flies? Are the ants building their nest in your SFG not to eat any roots or destroy the plants but merely because Mel’s Mix is so loose and friable that it’s easy to dig and make a nest?” Why do ants come in the house? Is it just for water in the kitchen, and is it possible that our perfect Mel’s Mix formula which allows water to be held in the vermiculite and peat moss waiting for the roots to need another drink is perhaps the attraction to the ants? Anyone know an entomologist? Or have any thoughts on this subject? We’d love to hear from you. I do my garden in plastic containers in a line, each just under a square foot. I have had aphids on my tomatoes. This happens some years but not others. I noticed one day that if a tomato had bind weed on it and that almost all the aphids & ants were on the bind weed. I can carefully unwound the bind weed and got rid of most of the pests all at once. So on those rare occasions when I weed, I always make sure to leave one strand of bindweed near my tomatoes in case the aphids come back. Now if I could only find something as effective for the bean beetles. That’s a great idea and I agree with it wholeheartedly. I’ve never heard of utilizing bindweed for that purpose, but I’m happy that it is working for you and will pass this info on to others! Do you have any other tips for others SFGers in Nebraska? Did you get in on our Fall Seed Kit and how late can you plant and grow in Nebraska? Thanks for your experience. I have a new FAQ book coming out: A Guide to SFG, later this year. Wish I had that aphid tip to put in it. Many years ago I noticed an ant problem in my garden. After hearing from all the gardening experts that ants pose no threat, they proceeded to ruin my zucchini plant and my radishes. I was able to trace them back to my compost pile where I didn’t mix in a bunch of “sweet” things that I had added a few days earlier to my compost pile. The compost pile material was fine, I just didn’t mix it in-and it was easy for the ants to find food. Since then, I’ve learned that if you see ants in your garden, there’s a strong possibility that you have aphids around. The relationship that exists between ants and aphids can only be described as mutual. Aphids consume large amounts of sugar rich fluids from plants and then excrete them-leaving behind what is called “honeydew.” It’s very high in sugar content and ants love it. They will go to great lengths to assure that aphids are well-fed and safe. Some ants are so hungry for the honeydew that they stimulating or milk aphids. They might even tear the wings of some aphids to prevent them from flying away and losing a source of food. 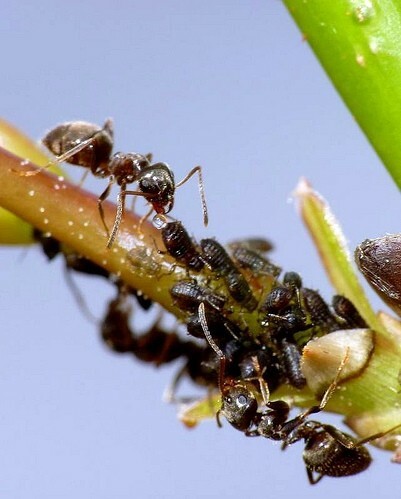 When a host plant is depleted of nutrients, ants will carry aphids to a new food source where they defend them from other predatory insects and bugs. In this way ants actually help aphids to live. If you have ants, you’ve probably got an aphid problem. Once you spot them, they’re pretty easy to eliminate or control. Don’t let anyone tell you that ants don’t cause problems in your gardens. Here in Florida, we get aphids regularly on our hibiscus, and we use Sevin powder on them. We also get fire ant mounds on the ground which are quite easy to handle, though I never knew fire ants love the little beans or pods(whatever their called) in Palm Trees. In August I was trimming the Palms and fire ants fell all over my feet and caused anaphylaxis with my breathing stopping, and pulse barely present. I note this because I never knew fire ants could kill a person, but if my wife (a nurse) did not find me, I would be dead right now. As far as ants in my several square foot garden boxes, I have never seen a single one, and never gave it a thought until you brought it up. I get a lot of hornworms in my tomatoes, and other than that lots of ladybugs, and worms in my corn (wish I could find a good way to stop those). I’m hoping more people will read this and realize the dangers of fire ants. They’re not to be fooled with, and there’s a very good reason they got their name. If any others reading this have any suggestions or have been succesful with eradicating fire ants or any ants for that matter, please send me your answers in comments so we can pass them onto everyone. I might suggest you also post this, Jeff, on our Forum. We have a lot of expert Square Foot Gardeners there, and they would be very pleased and thankful for your information. Give your wife an extra big hug for me, because we don’t want to lose any experienced and enthusiastic Square Foot Gardeners. Stay out of those trees! I am new to SFG, but ants sometime pose a threat to my earthworms as well. To get rid of ants I use agricultural lime. I sprinkle it around the bin and they go away. A friend of mine also used lime with his vegetable garden to get rid of ants. With SFG you don’t have to sprinkle the lime in your garden, it might change the pH of your soil, but I am sure you could sprinkle it around your SFG and in the isles between. Jannie–Thanks for sharing! Have you had to sprinkle it around your SFG? What part of the country do you live-and are you a certified SFG Instructor? I am from South Africa and as I said:I am new to SFG. I only shared what I’ve experienced with my earthworm bins.I wanted a natural way to get rid of ants because insecticides might harm my earthworms as well.I can’t explain why the ants stay away – I only know agricultural lime works. Taking the same reasoning: if I sprinkle the lime around my SFG’s, it might keep ants out of the gardens. How do I become a certified SFG instructor?